Providing you the best range of octagonal blender with effective & timely delivery. 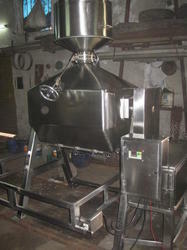 We are available with Octagonal Blender that efficiently processes larger volume of material. Designed to perfection these machines are of an octagonal shape and are compact in size compared to 'V' and double cone blenders. Moreover, these are high in demand in the global market owing to its less power consumption, low-speed blending and well balance in higher capacities.